If this card is Link Summoned: You can discard 1 card, then target 1 Special Summoned monster in your opponent’s Main Monster Zone; destroy it, then, if this card was co-linked when this effect was activated, you can draw 1 card. You can only use this effect of “Knightmare Cerberus” once per turn. Co-linked monsters you control cannot be destroyed by card effects. Situational Knightmare Link monsters continues with Knightmare Cerberus. Same requirements as the previous two, same style of effect, only this time a Special Summoned monster your opponent has in the Main Monster Zone will bite the dust. Link arrows pointing up and to the left like Phoenix pointing up and right, give it the same ease for co-link as Phoenix has. Scapegoat makes this and Phoenix easy with monsters left over. Each of the Knightmare monsters are great in their own situation, and while Goblin is the most practical with its extra summon, those link arrows pointing side to side vs an up arrow put it below these two in my opinion.You may always have a shot at your effect with any of the Knightmare Link Monsters, but that extra draw can be so important. This one is just below Phoenix because it has to be in the Main Monster Zone and be Special Summoned. That happens a lot, but you won’t get this effect online 100% of the time. The Knightmare continues with the opposite of what Knightmare Phoenix does, but still does its role well, Knightmare Cerberus. Cerberus is a Link-2 EARTH Fiend that requires 2 monsters with different names, has 1600 ATK, and arrows pointing Up and Left. Arrows do the co-linking and Extra Linking job well. ATK is meh, EARTH is a good attribute and Fiend is a good type. When Cerberus is Link Summoned, you can discard a card to target a Special Summoned monster your opponent controls in the Main Monster Zone and destroy it, then draw a card if this is co-linked. This is a hard once per turn effect of Cerberus. Nice to have a destruction effect for Special Summoned monsters, removal is always great, even if it is only Special Summoned monsters for the Main Monster Zone. While Cerberus is co-linked, your co-linked monsters cannot be destroyed by card effects. Yesterday was battle, today is card effects. If you can get Phoenix and Cerberus out and co-linked, you are basically immune from destruction, bonus if you can get Goblin to protect you from targeting. Cerberus does its role well just like Phoenix does, both are worth being staple in Extra Decks for various reasons. Art: 4/5 I like the orange on Cerberus similarly to how I like the red for Phoenix. Knightmare Cerebus works terrificly in tandem with the other two Knightmare Monsters we looked at so far. 1600 attack, Earth, Fiend, Link 2 with arrows that point directly above and to the immediate right, and Link Summoned still (wait for it) with two differently named Monsters. Yesterday we saw that if the Monster was co-linked you could discard and Draw and destroy a Magic or Trap card. Here, the discard and Draw holds true, but instead, you get to target and destroy a Special Summoned Monster your opponent controls, so long as it’s in one of their main Monster Zones. You get a different type of destruction, and a different protection here, from Phoenix and Cerebus. Yesterday your co-linked Monsters couldn’t be destroyed in Battle, here they can’t be destroyed by card effects, so link them together, and you can more or less lock your opponent out, and Goblin (from Monday) only is going to further protect you. These are once per turn, which keeps the Deck honest, and from being too broken. But it’s another beautiful asset to the theme, and I wouldn’t fault anyone for playing all three, or any part there of, in your regular Deck either. These Monsters are fast, they can be annoying, they destroy as well as provide, it might be dangerous. Art: 4.5/5 I like this a lot as well, Goblin is still my favorite thus far though. The American Holiday has gotten me, and I’m a bit late. 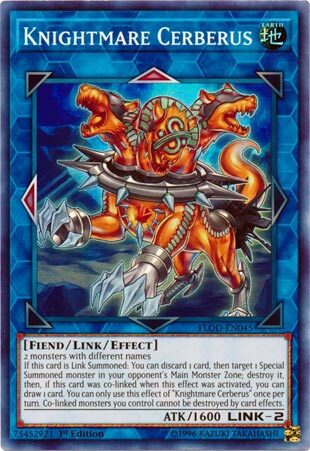 Fortunately, Knightmare Cerberus, the Link 2 Earth Fiend-type Link Monster with 1600 Atk with Up and Left Arrows, is probably the worst so far and doesn’t need to be described all that much. Protection from destruction effects is good but you can only destroy a Special Summoned monster that’s in your opponent’s Main Monster Zone. It’s Atk isn’t quite high enough, but if you end up with all of these co-Linked then you will be drawing a lot and being very well protected. Happy 4th of July! Go see Independence Day the movie and you’ll get it.